Microswitches are mechanically operated electrical switches designed with an actuator and terminals called common, normally open and normally closed. A micro switch is also known as a snap action switch, they operate by using a spring loaded lever to open and close a set of internal contacts inside the unit. How does a microswitch work? Power is typically attached to the common terminal, this leads into the switch and energises the spring and because the spring is touching the normally close pin it sends power out here, this is called a resting state. Once the arm is moved the power is then transferred to the normally open pin. Microswitches are differentiated by their electrical characteristics. These are small devices and generally only designed to carry low current and voltages. 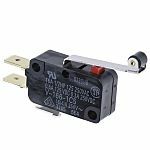 These switches are very commonly employed as safety devices, as they are reliable, inexpensive and can open up a circuit when needed, preventing a machine from being turned on or a door from closing when someone is in the way. There are various types available but the operating principles are the same, switches are actuated by a plunger, a button, a roller or a lever. What is their operating life? Microswitches operating life is generally very high, being measured in millions of cycles, in most cases. Consumer products generally have lighter-duty microswitches than industrial products, but the low cost of these parts makes it easy enough to upgrade to higher mechanical life expectancies when required or when it's simply beneficial to do so. 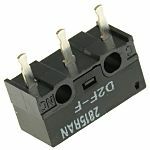 We offer a range of high quality sealed miniature and sub-miniature microswitches that meet industry standards and RoHS compliance. What type of applications need microswitches? Microswitches are used in consumer devices and industrial equipment. Common application for these devices are in door interlocks, microwave ovens or where a door has to be shut before the power to the device will turn on. Microswitches are also used in levelling devices, such as those used on vending machines. In an elevator, these devices are used in the door as a safety switch. Microswitches can be designed to be very sensitive. Such designs can be used in very precise equipment, such as that which measures the flow of air or other gasses through a system. These devices are used extensively in industry, often in control circuits.